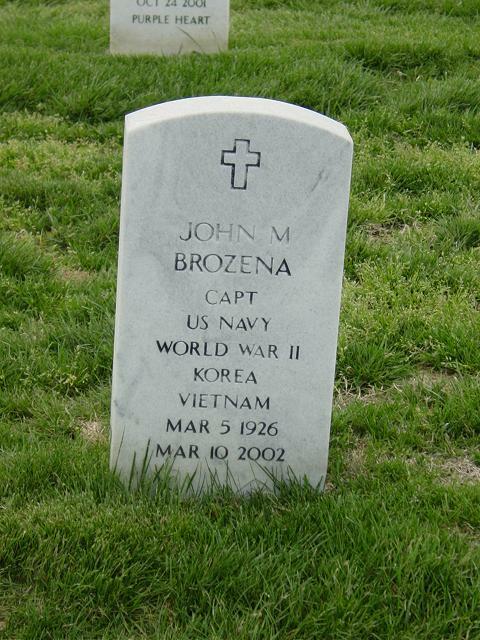 Captain John M. Brozena, United States Navy (Ret.) died on March 10, 2002 at Virginia Beach Hospital. He had a distinguised Naval career of over 31 years as an aviator and officer. During that time he flew more than eight types of Navy aircraft while accumluating more than 5500 flight hours experience including combat in the Korean War. He enlisted in the Navy in 1943, completing flight training in 1945. His first assignment was VA-45 with deployments to the carriers Roosevelt and Midway. In 1950 he transferred to VA-35 serving on the US Leyete, where he was awarded the Air Medal and Gold Star for air strikes against North Korea. In 1951 after marrying the former Eleanore A. Rogan he reported to Corpus Christi, Texas where he served as a flight instructor. In 1953 he was assigned to Naval Air Station Norfolk, serving as ground training and intelligence officer. He then attended George Washington University, where he graduated with a degree in Business Administration. After General Line School, he was assigned to the Naval Intelligence School in Washington, D.C. In May 1959 he reported VP-11 followed by a tour in Taipei, Taiwan serving as an Air Advisor to headquarters, Chinese National Air Force. In 1963 he was promoted to Commander while attatched to the Defense Communications Agency, Washington, D.C. where he worked on modernization of defense computer systems. In December 1965 he reported to Patrol Squadron VP 56, assuming command in 1966. From there he returned to Naval Air Systems Command in Washington, D.C. as project manager of the P-3C Orion aircraft development. He ended his career in the Navy serving from 1971 through 1975 as the Chief of Staff of the Naval Research Laboratory in Washington, D.C. retired from the Navy in 1975 with the rank of Captain. He and his wife moved to Virginia Beach where he continued his education at Old Domionion University. He is survived by his wife of 51 years, Eleanor Brozena, a son, John Brozena, Jr. of Lothian, Maaryland, daughters, Carol Carr of Dale City, Virginia, Mary Susan Owen of Manassas, Virginia, Barbara Wilhelm of Virginia Beach, Virginia, and eight grandchildren. He will be remembered as a loving husband, father, grandfather, and friend who devoted his life to his country, family, and community. A Mass of the Resurrection will be conduted 9 a.m. Friday March 15, 2002 at the Little Creek Naval Amphibious Base Chapel by Father Michael A. Diaz, Captain USN. Graveside services will be conducted 3 p.m. Tuesday, April 2, 2002 at Arlington National Cemetery with full military honors. Contributions to charity would be appreciated in lieu of flowers.